This website will continue to be a work in progress. Please check it occasionally for updated memories of Dad & Mike. From A Celebration of Jim’s Life, Saturday, March 5, 2016 at First Presbyterian Church of Santa Barbara. the Celebration of Jim’s Life, Saturday, March 5, 2016 in Santa Barbara. On November 25th, 2015 Jim Dixon suffered a major heart attack and spent the next 34 days at SB Cottage Hospital having 2 additional surgeries for his heart. Unfortunately, he was not able to successfully recover. 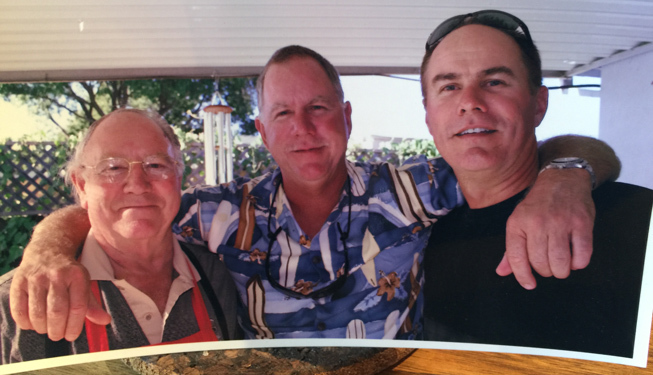 Jim spent his final days at the Serenity House in Santa Barbara receiving excellent compassionate care with his family by his side when he passed away on Friday February 5th, 2016 with his son John holding his hand. Jim loved the grocery business like no other, it was his passion to say the very least. 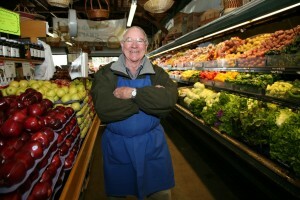 His farming & grocery career began 70+ years ago as a young man. 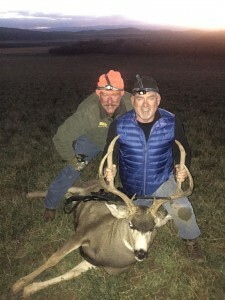 He also enjoyed ballroom dancing and his Crystal Cruises all over the world with his wife Barbara, ice hockey, and his annual hunting trips to Colorado with his son Michael who lived in Kona, Hawaii. 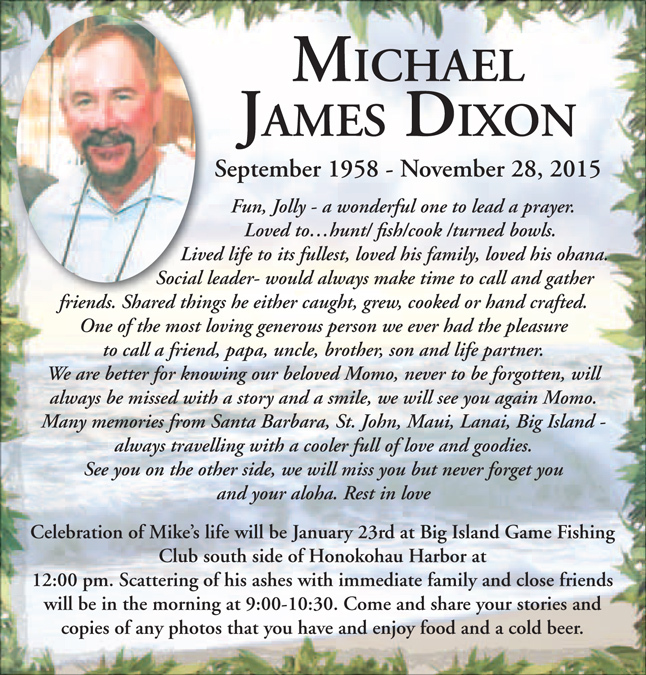 Unfortunately, Michael James Dixon also had a heart attack and passed away on Saturday November 28th, 2015, only 3 days after Jim’s heart attack. They both will truly be missed. 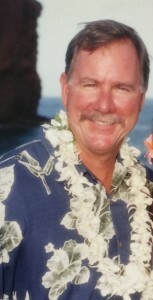 Jim was a generous caring man who loved his family, friends and customers. He is survived by his wife Barbara, two daughters, Cynthia and Sherry, his best friend Roke Fukumura (who continues to work daily at Tri-County Produce at the age of 93), and his son John Dixon, who has partnered side by side with Jim operating Tri-County Produce since 1985. Tri-County Produce will of course continue operating as usual with our wonderful team of people under John Dixon with the same philosophy taught by Jim, “Quality & Freshness are the #1 important goals”, along with great customer service! First Presbyterian Church of Santa Barbara 21 East Constance Ave.
Public invited. A reception will follow. Celebration of Mikes Life was held Saturday February 13th ,2016, beginning with A scattering of ashes at 745am on the Condor leaving the Santa Barbara Harbor with family and friends. Followed by a fabulous Mike Dixon style gathering (great food & drink) at the Santa Barbara Carriage Museum at noon. Aprox 175 friends & family attended sharing stories & memories of Mike by many. Micheal was a Fun, Jolly person, a wonderful one to lead a prayer. He Loved to … hunt, fish, cook, woodworking turning bowls. Lived life to it’s fullest, loved his family and friends. A social leader He would always make time to call and gather friends. Shared things he either caught, grew, cooked or hand crafted. One of the most loving generous person we ever had the pleasure to call a bother, friend, uncle, son, and life partner. St. John, Maui, Lanai, Big Island – always travelling with a cooler full of love and goodies. See you on the other side, we will miss you but never forget you and your kindness. If you have photos to share please email them to DixonMemories2016@Gmail.com and we will add them to this site as it will always be a work in progress. If you would like to donate by check please make payable to American Heart Association (or AHA) and note SB Heartwalk on memo line. The Dixon family proudly supports the American Heart Association in their efforts to fight heart disease. Each year John Dixon leads in the annual Santa Barbara Heart & Stroke Walk to raise much needed funds to help save lives.